Using a bike during the cold and long months of winter is not at all an easy task. Because it is essential to keep yourself warm and protected in difficult meteorological conditions, we have prepared a list of tips that you should read. The first thing that you should do to make sure that you are protected from the cold is to get insulated. Therefore, you should invest in a balaclava, a type of protective piece of equipment that fits over your head and under your helmet so that you are shielded from the cold. Balaclavas are regularly made of silk and other materials that can pull the moisture away from your skin. As expected, balaclavas come in numerous styles depending on the level of protection that you are interested in. Most bikers out there point out that purchasing a product of this type can make a significant difference. Next, it is vital that you always wear a thermal layer underneath your clothes. Generally, the outer layer of cold-fighting gear only blocks the heat-sapping wind. Therefore, by solely relying on one layer, you risk freezing while out on a ride. Consequently, it is recommended that you also put on an additional layer of clothes so that the heat of your body won’t escape. From this point of view, you can invest in a pair of long johns, or you can purchase thermal attire that was explicitly designed to cater to the needs of riders like you. Lastly, if in the area that you live in the temperatures are lower than average, it might be best that you spend some extra money on electrical gear, as you will surely won’t regret it. Still, it should be pointed out that electrical pieces of clothing require an electric outlet to be added to your bike. According to the specialists, if you decide to go electric, you should find the time to experiment with the kind of clothes that you intend to wear underneath as wearing electric clothes directly against the skin is problematic as it can lead to scalding. Also, if you wear too many layers in between, chances are that the electric items won’t be as effective. Another practical piece of advice that you should consider following is having a waterproof outer layer, especially when moisture is present. Apart from keeping rain out, rain suits also act as a shield that blocks the wind. The most significant advantage of rain suits is that they are available in numerous shapes and sizes. Thus, you will surely be able to find a model that caters to your needs entirely. To make sure that all your clothes are sealed from moisture, you can also buy spray-on sealers. 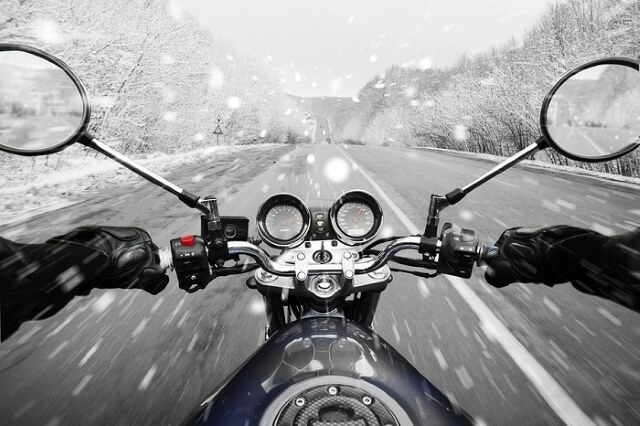 Moreover, although most winter clothing pieces intended to be worn by bikers can effectively keep the cold out, even a small crevice that lets the cold air get in is problematic. So, it is essential that you purchase gauntlet-style gloves that fit over your jacket as well as high boots. This way, you can be sure that your effort of being completely sheltered from the cold will not be undermined! As we all know, once they get soaking wet, boots take a long time to dry. If you want to avoid this inconvenience, it might be a good idea to use gaiters. Yet, if you already own a rain suit, it is worth knowing that gaiters might not be necessary. What is more, fellow bikers recommend that, when it comes to equipment that is meant to be worn during the chillier months of the year, one only invests in waterproof boots. Whenever you go shopping for new clothing pieces, remember that, first of all, you have to protect your extremities, as they are most likely to get frozen first. Another practical investment that you might find useful is heated grips as they can keep your hands warm and functional at all times, no matter how low the temperature gets. Even more so, a heated seat is also a great addition to your bike, especially if you intend to travel a lot during winter. What makes heated seats stand out is that they actually heat the blood that is making its way to your legs, feet, and toes. As a result, you won’t have to deal with numbness in your extremities. As you know by now, keeping yourself protected from the wind is a crucial element when it comes to being a biker. That is why, during the colder period of the year, it might be a good idea to adjust your windscreen and place it in the highest position. Plus, it could be a good idea to purchase an aftermath windscreen that is slightly taller and, as a result, more protective. As seasoned rides have noted, the easiest way to warm up is by eating. This is true because, after eating, the body starts burning calories in order to digest the food and, therefore, heat is produced. If you are traveling over a big distance, it is vital that you take regular breaks whenever you start feeling too cold or numb. This is vital because riding while feeling cold takes away from your ability to stay focus on the road. Because of this, you are more likely to be involved in an accident. Whenever you take a break, it is also recommendable that you take a short hike or walk. A quarter to half a mile should suffice. By doing so, your body will start feeling warm again because of the blood circulation. If you want to find out more about how to transport your motorcycle, don’t forget to take a look at our recent article as you will undoubtedly consider it quite informative.